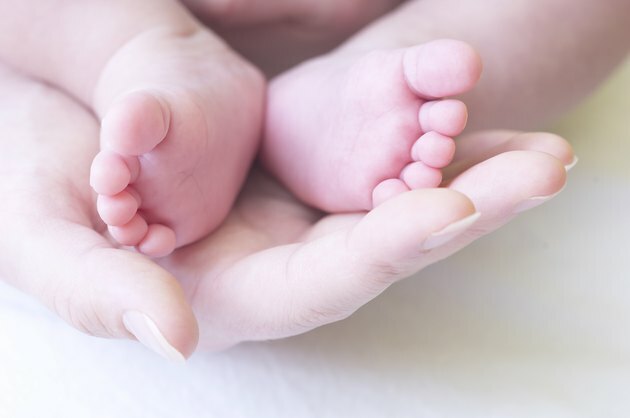 Podiatrists consider the first year of a child's life to be the most important stage in the development and growth of the foot, according to the American Podiatric Medical Association. A child's foot grows significantly during the first year. Foot growth in children is determined by hereditary factors and the pressure applied to the foot as it develops and grows. Unless the foot is subjected to abnormal pressure, or other interference with its natural growth pattern, podiatrists know what to expect in terms of normal foot growth based on age and gender. A child's foot grows nearly 1 cm each year, according to Leonard R. Janis, D.P.M. Between birth and 4 years of age, a child's foot doubles in length. By the age of 10, most girls have completed 90 percent of foot growth. A boy completes about 80 percent of his foot growth by the time he is 10 years old. The feet have stopped growing for most girls 14 years of age. Foot growth stops for boys when they reach 16 years of age. The function of the foot is to support the body and absorb shock. The structure in the foot shift, align and adapt to different surfaces. The fully grown foot has 26 bones that are part of a complex system of nerves, blood vessels, muscles and ligaments. A child's foot has few bones compared to the adult foot. New bones continue to grow in a child's foot until the foot stops growing. Podiatrists use x-rays to determine if a child's foot growth matches what is expected for his age group. Doctors examine the feet of newborns to look for potential problems that can affect the normal growth and development of the feet. Podiatrists recommend an examination when the child is 4 to 6 months old, the time when most children try to stand. Most children begin to walk unassisted by 10 to 14 months of age. A podiatry exam every 2 years after a child reaches 10 years old can identify problems early. A child's foot is soft and flexible. Abnormal pressure, such as that caused by poorly fitting shoes, can affect the growth of a child's foot. Tight foot coverings that restrict a child's movement can affect his foot growth, according to the California Podiatric Medical Association. A child who is beginning to walk should do so barefoot to allow for normal foot growth. Proper fitting shoes and socks are important for normal foot growth in children. Children need larger shoes and socks to accommodate new foot growth. Podiatrists caution against handing down shoes and other footwear and recommends sizing footwear to fit your child specifically.